Summary: Ed Wilson, Microsoft Scripting Guy, talks about parsing output from NetStat with Windows PowerShell 5.0. Hey, Scripting Guy! I need a good way to parse output from the NetStat command. I use it all the time, but it ends up requiring me to spend a lot of time looking through stuff. I am not sure if the command itself has a filter language or what, but I really need to be able to parse on the fly. I have even gone so far as run the command, copy it to the clipboard, paste it into Notepad, and then go through the Notepad file adding characters so I could import it into Excel and filter the output. But obviously, that is a lot of work. I really need to be able to see stuff like what connections are open, closed, and suspended. Can you help me? Microsoft Scripting Guy, Ed Wilson, is here. It hasn’t started raining yet, but I am sure it will. I mean, summer in central Florida? There are two things one can count on: an afternoon thunder storm and humidity. Lots and lots of humidity. I am not sure what people did before air conditioning around here. Maybe they lived in St. Augustine where they could go to the beach every day. Anyway, just like I can count on a summer thunderstorm in central Florida, I can also count on the fact that I am going to have to parse text at some point. 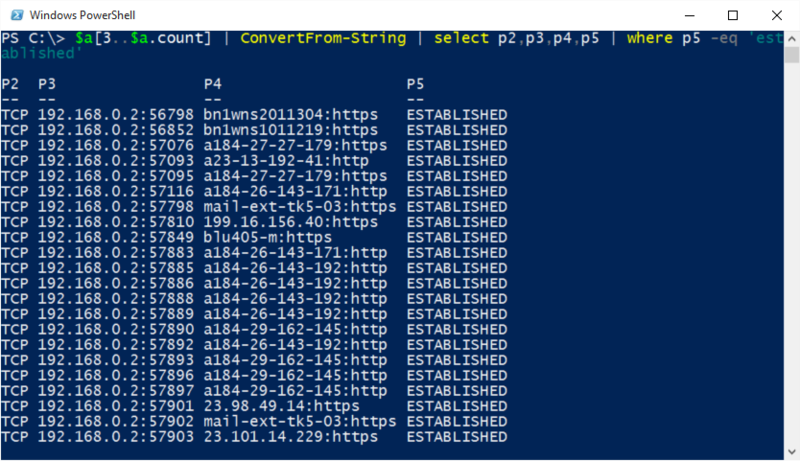 Luckily that task just took a giant leap towards simplicity with the new ConvertFrom-String cmdlet in Windows PowerShell 5.0. JK, parsing output from NetStat just got a whole lot easier. In the past, I have written complicated scripts to parse the output from NetStat. I mean it was nearly 20 or so lines long, and it took me a couple of days to accomplish it—but in the end, I was able to output objects that permitted me to filter my output. It was worth it. But as of Windows PowerShell 5.0, the script is completely obsolete. 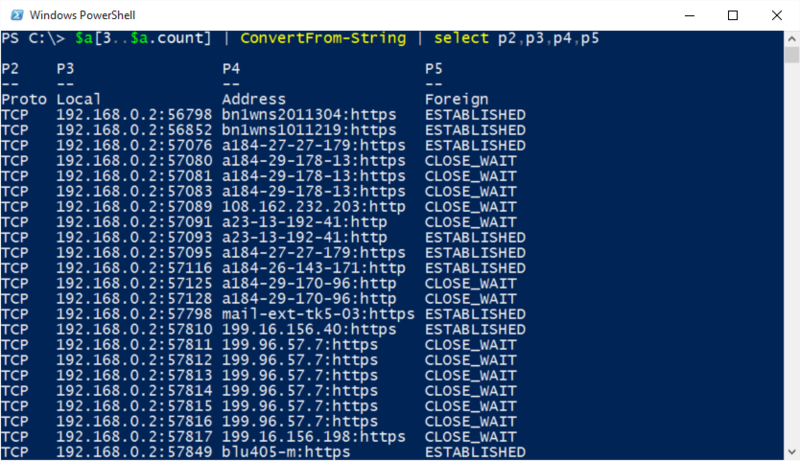 When I have my output from NetStat converted into true objects, I can use the entire power of Windows PowerShell to search through the objects and find exactly what I need—and I can do it all in a series of one-liners. That truly is the power of PowerShell. JK, that is all there is to using ConvertFrom-String to help parse NetStat output. Join me tomorrow when I will talk about more way cool stuff.